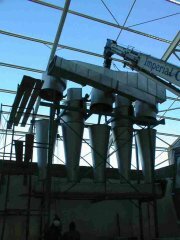 The Dendron factory	 Erection of the starch dryer. The cassava-to-starch processing plant erected by CS Manufacturing in Dendron, Northern Province, at a cost of R28m, is not only the first commercial cassava processing plant in SA, but one of the few functioning in Africa. It is also being supplied by the largest commercial estates producing cassava in Africa and possibly the world. The plant was opened on January 22. 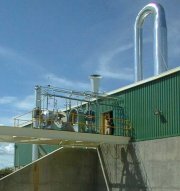 It began producing at about end-January and it is planned to be at full production of 60t/day starch by September 1999. This production rate indicates that it could produce about 20 000t/year, or about 20% of the current SA starch market. Later, according to Jim Casey, managing director of CS Manufacturing, further starch plants will be constructed in Dendron or elsewhere where conditions are suitable for cassava growing (possibly Mpumalanga). CS Manufacturing might also begin producing glucose. About 240 000t/year of glucose is sold in SA. The commercial farmers of Dendron have not taken quickly to production of cassava. They apparently regard the crop and the factory as unproven. Also, the prices being offered for cassava by CS Manufacturing are much lower than they fetch for potatoes and other crops currently grown in the area. There are, however, various advantages to growing cassava, and local farmers are watching the project closely. Undeterred, and contrary to its original plan, CS Manufacturing has filled the gap by growing cassava on its own farms near the factory. These farms currently account for 50% of the capacity of the new plant. Casey says CS Manufacturing will grow an even higher percentage if outside production can be procured. The setting up of its own commercial farms by CS Manufacturing - where production elsewhere in the world of cassava is on a peasant basis - accounts for the fact that its Dendron estates may be the largest cassava estates in the world. There are few functioning starch-from-cassava plants in Africa outside of Nigeria; there are many in Thailand. The technology used at the Dendron is the same as that used in Thailand  where it is often used on an even smaller scale  and is well established. Casey said at the opening that CS Manufacturing has, since 1993, taken 25% of the starch market for SA paper and board production with the imported Thai cassava starch, and 15% of the overall starch market (including food). This imported product will now be replaced by the locally-made product. Hitherto, all starch produced on the SA market has been derived from maize.